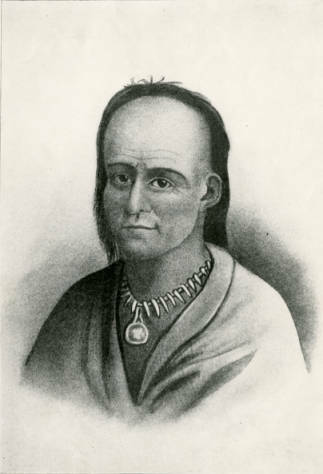 Chief Little Turtle was born around 1752 near a small village along the Eel River, just northeast of present day Columbia City., Little Turtle was known as Meshekinnoquah to his Miami people, but to the rest of the U.S. during his time, he was one of the most feared and respected leaders during the frontier wars. Little Turtle rose to prominence as a warrior in 1780 when he destroyed the United States irregulars of Colonel Auguste LaBalme. LaBalme attacked the Miami town of Kekionga, present day Fort Wayne) and Little Turtle drove his forces out of his native’s town. However, the attempted attacks on Kekionga continued. On October 22, 1790, Little Turtle assembled troops from the surrounding regions to battle and eventually defeat General Josiah Harmar and his U.S. troops, who were sent by President George Washington. 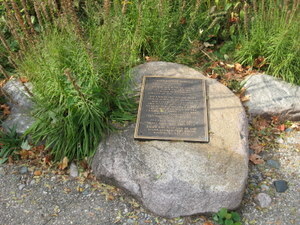 It was not until 1794, that the U.S., under General Anthony Wayne, defeated the Indians at the Battle of Fallen Timbers. Little Turtle had insight about the strengths of Wayne’s army and did lead the Indian’s in this battle. Little Turtle received his intel from Wayne’s Chief of Spies (and Little Turtle’s son-in-law), William Wells. After Little Turtle ended his military career, he quickly became a diplomat for his people. He was a principal negotiator for the Indians at the Treaty of Greenville in 1795. He made several trips to Washington D.C. and met with President Washington, John Adams, and Thomas Jefferson. Little Turtle died peacefully on July 14, 1812. His grave was almost found a century after his death on Lawton Place. His memorial was created in 1959 through the generosity of Eleanor Smeltzly and Mary Catherine Smeltzly under the sponsorship of the Allen County-Fort Wayne Historical Society. His memorial now serves as a small local park.